It's the company's first visual smart speaker. Yes, those leaks of Google making its own smart display were true. The company has unveiled the Home Hub, which melds an Assistant-equipped smart speaker with a 7-inch touchscreen display. As with other smart displays, you can use to both get visual feedback for searches (such as the weather or recipes) as well as finding photos and videos. However, it does have a few stand-out features of its own -- including things that are missing. For one, there's no camera. Google is clearly aware of privacy issues and wants you to feel comfortable putting a Home Hub in your bedroom and other sensitive areas, even if it means missing out on video chat. There's also a new Home View dashboard that gives you a quick glance at all your smart home devices, whether you're looking at the Hub or Google's mobile Home app. The display itself also auto-adjusts to lighting throughout the day (no more staring at a bright, harsh screen at night), and you can now display live Google Photos albums that update as you take pictures. It's not a raw photo dump, either, as Google is using machine learning to eliminate blurry and badly exposed shots. The Home Hub is available to pre-order today for $149 and will ship in the US, UK and Australia on October 22nd. It's evident that Google is betting the price will be a key selling point. It undercuts both other, larger Assistant smart displays (like Lenovo's $200 model) and Amazon's latest Echo Show by $50 or more, and costs only slightly more than the original Home did when new. 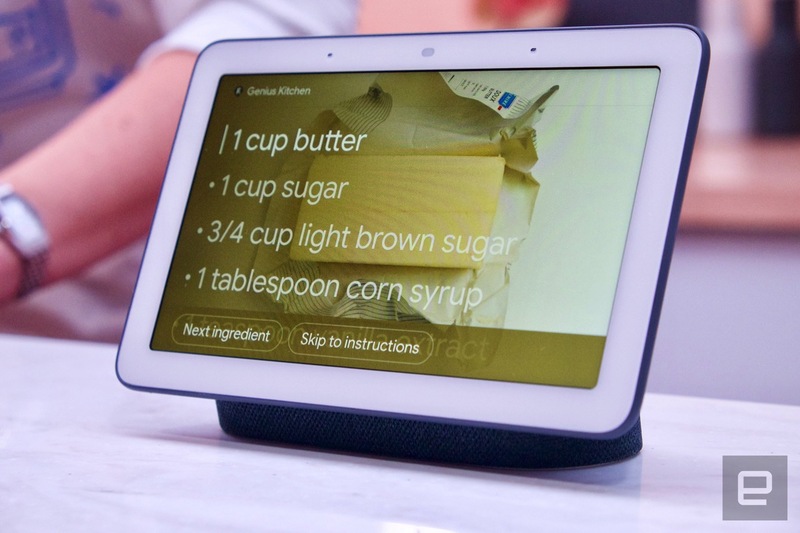 Google wants you to see smart displays as the new normal, and it's willing to price aggressively to make that happen.